Libby's Little Addiction: Well, la de frickin' dah! 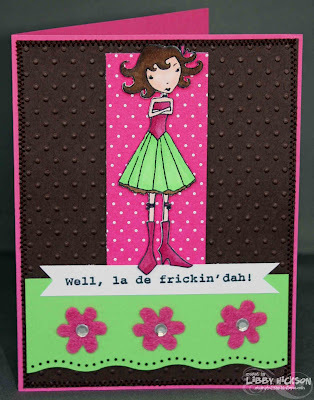 Boy do I have a super sassy card to share with you today! I recently discovered a new-to-me stamp company called Stampotique Originals! I first noticed them on my friend Tina's blog and immediately fell in love! I mentioned this in front of my friend Kim, and what did she do?? Stamped off a whole mess of images and sent them to me!!! I *HEART* KIM!!! Well, this was many, many weeks ago. Yesterday Kim was harassing me just a little about the fact that she hadn't seen any finished cards with them yet. Soooooo I thought I'd better do something about that! This girl and this HILARIOUS (imho) sentiment are my absolute faves. Isn't she adorable?? I also FINALLY played along with a Color Throwdown challenge this week - it's been killing me not to be playing along with their challenges, the last few color combos have been so awesome! But I thought this week's combo of Green Galore, Pink Passion & Chocolate Chip was too sassy to miss out on, just like my girl. Thanks so much Kim, I just LOVE these images!! I'll be placing a LARGE Stampotique order soon, they ROCK! :-) Thanks for stopping by today. Goes right along with my favorite saying... "Whoop de freakin' do!" LOL CUTE card, Libby! Glad to see you playing the Throwdown this week! I shouldn't be surfing your blog as I'm trying to get my FCC card done in the knick of time but your card ROCKS!! Love the colors you picked for it, it's one of my favorite color combos for her! how cute! I'm wearing a t-shirt by BIG DOGS that has that same saying - its my favorite and I was so bummed when I got glue on it so now I can't wear it out in public! Cute card! I love the colors. Those colors are perfect for the attitude of the statement. Love it! TEEHEE!! I love this!! That sentiment is too freakin' funny!! :) Your colors just rock on this too girl!! Love this card!! What a fun card!!! Thanks so much for playing! Libby! You did an awesome job on her! I just love the "sassiness" she portrays! And don't we all have moments like that! LOVE this sassy card!! Great job on the colors and your coloring! Cute card and great sketch!! Thanks for playing the Throwdown--hope to see you again next time! you said it, sassy! This is adorable & I love the colors, the green really pops out. Oh now that's too funny! Love the saying and she is a cutie! Great card! Thanks so much for playing the CTD! I love it. What an awesome stamp. I can never seem to find stamps that say just the right thing. Funny and cute. Sassy, indeed! Love that cute image and how you used the colors! Great polka dot theme going on here too! Thanks for playing with us again! Heehee! She reminds me of my daughter a few years ago....wait, no, she's STILL like that! I still love her though! CUTE card, love the way you've used the colors here!